"to enable us to serve him without fear in holiness and righteousness before him all our days." This was amazing to me. I struggle a lot with feeling the need to perform in my mind. Feeling the pressure to live up to expectations, and God has been working on me lately to sink the gospel deeper into my heart and continually remind me it is finished, and Christ's righteousness has been granted to me forever. There is amazing freedom in knowing that. 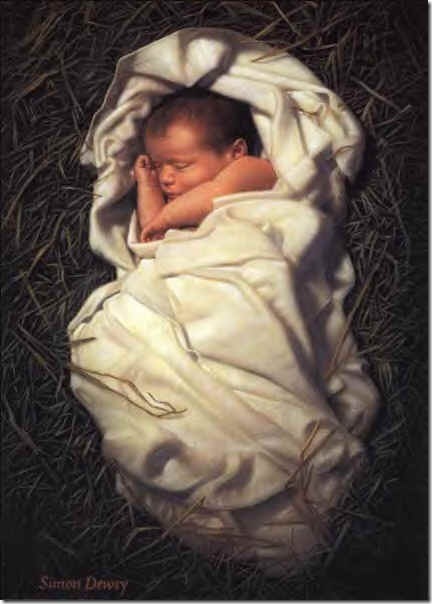 To think about Zechariah's day, when it was keeping the law, and doing and doing, and making sure to stay within the bounds, they must have always felt fearful to break the law, then comes Christ, entering the world as a baby king, born in hay, and all the rules and laws were satisfied for those who believe. And because of that, I serve God without fear. When I obey, or do something right, I do it with complete freedom to love my God with a pure heart, because the consequence of not obeying is gone. When I sin and fall short (which happens most often) I do it without the fear of any punishment or separation because I live (as Zechariah said) "in holiness and righteousness before him all my days." Did Mary have any clue when she looked at that tiny baby in that stable, that for thousands of years to follow the righteousness and victory that this man won, would be granted to countless people who were then freed up to walk in liberty and serve God freely with no fear? So as I open my gifts tomorrow (some of which I am, materialistically, OVERLY excited to receive...yes, I buy presents for myself and I love it), I will think of the gift of Christmas. Not just forgiveness of sins, which would be more than enough, more than I deserve, but liberty to serve, a perfect record of righteousness forever, the constant love and acceptance of my heavenly father, the right to call Jesus "big brother", the prayers and intercessions of my savior, the freedom to run the race of life without any entanglements of sin or fear holding me back, and the countless other gifts that came to this world freely, wrapped in the humble package of a baby to a poor family. The tiny package, who's gifts would pour out to equal blessing upon blessing for generations. The light that broke into this dark world and shone on the faces of those dwelling in the shadow of death, inviting them to step out of that darkness forever. And all this granted to us by the same way Mary was blessed, "Blessed is she who has believed that what the Lord has said to her will be accomplished." (Luke 1:45) By turning our eyes to him, day after day, believing that he's too good to lie to us. Merry Christmas, may you open gift after gift of your great salvation this next year, or for the first time, see the light shining on your face. Truly awesome and inspired Jenn. I'm sending the link to my family. God has done truly remarkable things in your life and you are so blessed.